The new year is days away — a time to reflect perhaps? I’ve worked in publishing for almost three decades, and without fail, the first issue of the year in the UK would heavily feature weight loss, de-junking or makeover features. There would for sure be a main cover line, ‘New Year, New You’, with a promise that if you followed the diet plan within you could ‘lose 7 pounds in seven days’. As I designed these promise cover lines, I was always a little sceptical. Was it true, is it possible? The answer is a big fat no, unless your meal plan was bowls of ice — for breakfast, lunch and dinner. So why so much pressure to shed the holiday pounds? I guess it sells more magazines. These are also the same magazines that detailed the know-how on being indulgent over the holiday celebrations. It’s no secret diets and weight loss programmes aren’t fun. I remember in January the UK media bombarded us with weight-loss adverts. Reality TV ‘stars’ would be promoting their ‘10-minute’ workout DVDs, with of course the obligatory before picture looking glum, and then the fabulous reveal image. I’m not a nutritionist, but nor a fool, and this is not achievable unless you’re skilled in Photoshop. I’ve been out for dinner and seen friends order a ‘heathy salad’, only to watch them drench the leaves in calorie-loaded dressings, and a sneaky side order of fries. OK the fries were a mistake, but it’s that dressing that turns what should be a low-cal lunch into a leafy burger of sorts, in terms of calorie content. This new year go beyond the limp leaves, carrots and tomatoes. Instead of calorie-heavy dressings, try a drizzle of olive oil, lemon juice and some garlic salt, adding taste and texture minus the calories. Or add pulses like chickpeas — these little boys will plump up your salad and keep you feeling full. I love sun dried tomatoes from the deli; I add them to a leafy salad, and use the herbs infused oil as a dressing. One of my best tips to dress a salad is balsamic gel. Available in most stores, this little gem is genius, and rather than sink to the bottom of your salad bowl it sticks to the leaves, so every mouthful is tasty, and packed with flavour. Without leaving a pool of tart vinegar at the bottom of your bowl. The two recipes alongside kick salads into 2019 and say goodbye to dull leaves. Spice it up — I’ve seasoned a chicken fillet with five spice, grilled it with a little oil, then served it on a bed of bean sprouts and cabbage, served in lettuces leaves, so you can even eat the bowl. Crunchy, spicy and most of all tasty. I’ve mentioned bulking up a salad with pulses, so add kidney or butter beans and sweetcorn, or like in my second recipe, fruit. I’ve talked fruit in savoury dishes before, but this really works. The avocado and mango with the zest of the lime, coriander compliment each other, and guess what? No heavy dressing. So as we say goodbye 2018, lets say hello to some low-cal tasty salad bowls. A very happy New Year from me, see you for more food talk in 2019. Chop the spring onion and add to a mixing bowl. Then add the coriander, cabbage, sesame oil and season. Combine the ingredients together, then using a small melon baller scoop out the avocado and add to the bowl. Slice open the mango and scoop out the flesh. Add the lime juice, mix, then chill in the fridge for 30 minutes. Finally, serve topped with fresh chilli, lime zest and a drizzle of sesame seed oil. Heat some oil in a pan and gently grill the chicken. Add the five spice and cook evenly on both sides. Remove from the heat and allow to cool. Wash and place the leaves in small bowls. Layer in the pepper, bean sprouts, carrot and cabbage. 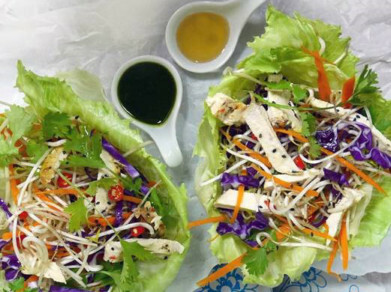 Slice the grilled chicken and add to the lettuce cups. Top with coriander, chillies, and season. Dress with sesame oil, black sesame seeds and green chilli sauce.